Turkmen carpets - one of the world's most popular "families" of handmade carpets. In the modern Republic of Turkmenistan carpet is one of the approved national symbols: the carpet pattern presents in the flag of the country, the carpet is officially declared state property, National Day of the carpet is officially celebrated in the country. The emergence of Turkmen carpet, possibly related to the heyday of Assyria, Babylon and Egypt, whose proximity to Turkmenistan by the trade as far back as ancient times, had paved the carpet, and with it, and dyeing. The origin of Turkmen carpet making may concern to the period of the blossoming of Assyria, Babylon and Egypt, the Turkmen territory proximity of which by the way of trade relations in antique period laid down the foundations of the carpet making and dyeing. The carpets of the Turkmen weavers (or rather, woman weavers - Turkmen women are engaged in making carpets) became known in Europe long ago. Even in the fourteenth century Marco Polo wrote about the Turkmen (Turkmen carpets): "They make the most graceful and beautiful carpets in the world." All Turkmen tribes have their own historical well-established pictures of the carpet. But there is a feature, which gathers Turkmen carpets, dominates on the majority of them. This is gyol, “flower”, repeating eight-sided medallion, by which the whole surface is covered. Each tribe has its gyol, according to which the carpets are classified – they are called by the name of the tribe, which makes it. The Turkmen carpet is not only the mastership, but also the necessary thing of household use. The Turkmen carpets by their use divided into khali – carpets, which were used as decorations of dwellings; namazlik – small carpets, which earlier were used as under layers during the prayer, and gapikilim, ensi – carpets of medium size for covering the entrance to the yurta. 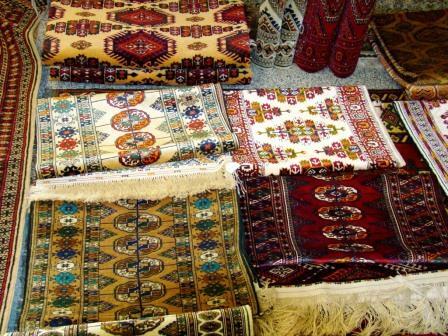 Besides the carpet products include different bags – torba, hanging on the walls of the house or yurta for keeping small house things; sacks – chuval, maprach – for keeping dresses, linen and other things having ornamental importance at the same time; saddlebags – khorzuun and, at last, decorations – osmaldik, khalik – for the camel pack, and different kinds of carpet ribbons – akyul, golan (polam) length 10 – 15 m. and width 20 – 40 sm., which are used for the decoration of inner walls of the yurt and for banding its outer felt covers. In the Turkmen carpets red colors dominate, range of colors varies from dark red to almost blood red. Among other colors there are mostly black and white colors, and blue color - in the yomut carpets. White gradually gets a shade of ivory, and red colors fade somewhat, that gives special lightness, harmony of flavor to old carpets. The density of the Turkmen carpets is different. The most frequent carpets of low-density - 100-200 thousand knots per square meter, but there are Turkmen carpets the density of which is 600 000 knots per square meter and more. 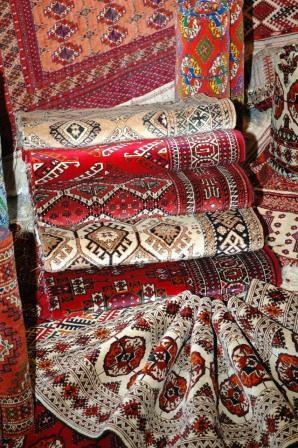 The main part of the tekin, yomud and other Turkmen carpets in the market has small size - from 60 to 90 centimeters to 1.5 for 2 meters, but the carpets of large size are also not uncommon. Another feature of the Turkmen carpets is a pattern - geometric, with the characteristic of each major tribe. The division of the field and border is particularly clearly noticeable in large carpets. In the center in a staggered order there are octagons and rhombuses filled with different patterns; for example, in the carpets of the yomuts, the pattern is performed in the form of jagged rhomboid rosettes. Among the Turkmen carpets there are pile carpets (chitme techniques) and without pile carpets (kakma techniques); along with these two major types the intermediate type occurs when the pile pattern is performed on a background with pile. The laborious techniques of manufacturing the Turkmen carpets do not allow to work fast. Usually within a month of hard work the Turkmen woman can weave 4-5 meters of the carpet. Several women, seating in a row, may work at the producing of wide carpets. Carpet weaving has got a new impulse of development. But today it works in specific Carpet weaving cooperatives. Turkmen women, masters of carpet weaving, learn new techniques, new motives of ornament. Now, one can often see the Turkmen carpets with various subjects. They are manufactured on special orders by the carpet-makers.